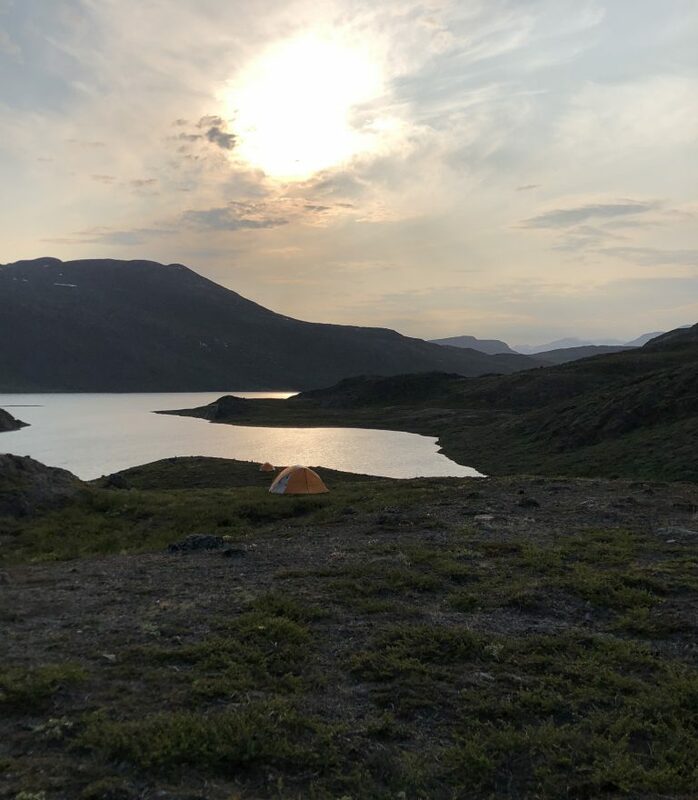 We are anxious to get to ‘Lake Gus’ a small lake on Greenland’s western flank just west of Kangerlussuaq and north of the Arctic Circle at N 67°01’57.13” W 52°23’22.77”. 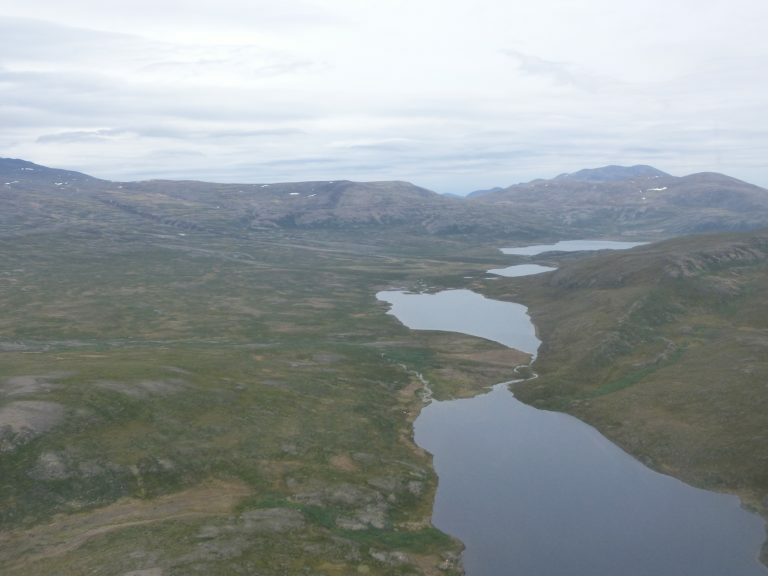 For this early part of the season we are focused on sampling water and representative plants from the catchments of some of the many freshwater lakes scattered on the landscape further away from the ice sheet. The goal is to tease apart a record of historic precipitation and temperature for this region using isotopes from leaf waxes collected in the lake sediments. Freshwater samples will also be collected from surface lakes in the area, as will samples of the most dominant existing water and terrestrial plants in the catchment. Although ~82 percent of Greenland remains covered by an ice sheet, the thick persistent ice that once covered this west coastal region retreated several thousands of years ago. The actual retreat occurred slowly with ice pulling out of the ocean first and then marching back across the landscape over a time spanning some 10,000 years, reaching the general footprint of ice we find today close to 7000 years ago. As the ice retreated it gouged and eroded the bedrock surface as it moved, creating collection points for water to pool. Greenland’s lakes dot the exposed landscape, many lie in connected strings, a formation known as ‘paternoster lakes’, a reference to the linked beads of a rosary. Both of our early season lakes are part of such a string. 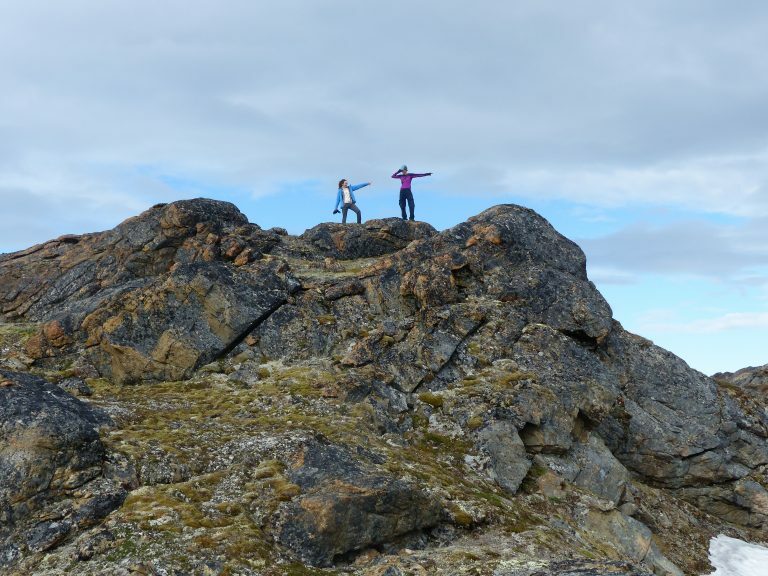 Many of the Greenland lakes the Snow on Ice team works on are unnamed on the map so the field team has taken to naming them after local wildlife, plants found at the location, or family members. Lake Gus, named after the son of some of the science team, will be the location of our first of two camps for this part of the 2018 field season; both camps will be situated on mid-sized freshwater lakes. This lake is actually a return visit for some of the team. Gus was spotted late in the 2016 season when several members from this year’s team were sampling a larger lake in the chain. 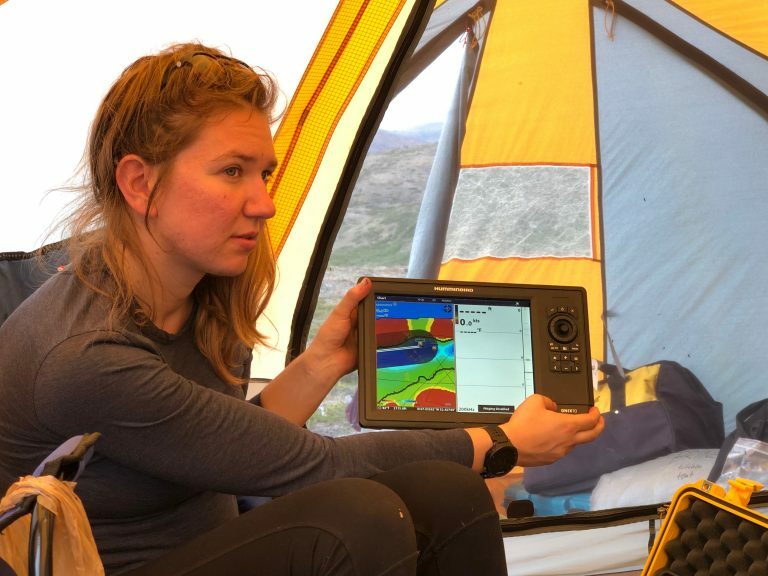 A final afternoon excursion that season ended with a trip to gather bathymetry data to build a map of the lake bottom and the collection of a small core, less than a meter in length, from over the side of the small soft-sided inflatable boat. Results from that small section of core triggered the return to Lake Gus this season for the collection of a longer piston core and a much longer lake precipitation history. 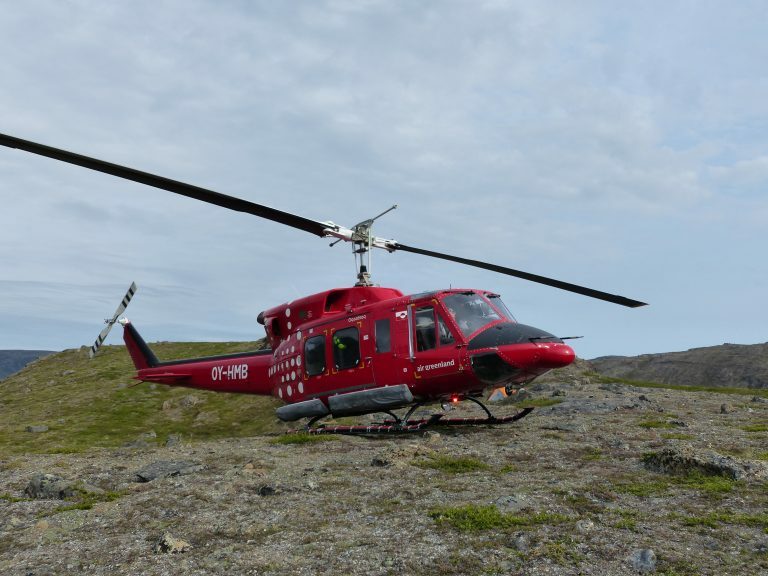 As the large Sikorsky helicopter was on emergency evacuation watch up the coast of Greenland (it has since been released as the looming iceberg dislodged and headed north), we made arrangements to bring our group to the camp site using several flights of a smaller Bell 212 helicopter. The pilots of the Bell 212 were confident they could get us to the field in one flight until they saw our field gear. There is a fair amount of gear required for our work including a small inflatable boat and motor, a wooden coring platform with two inflatable pontoons and a piston set up, long and short core tubes, pumps, rope spools, several tool boxes, rock hammers and chisel, plant and water sampling vials, along with tents and food for 6 of us for our time in the field. 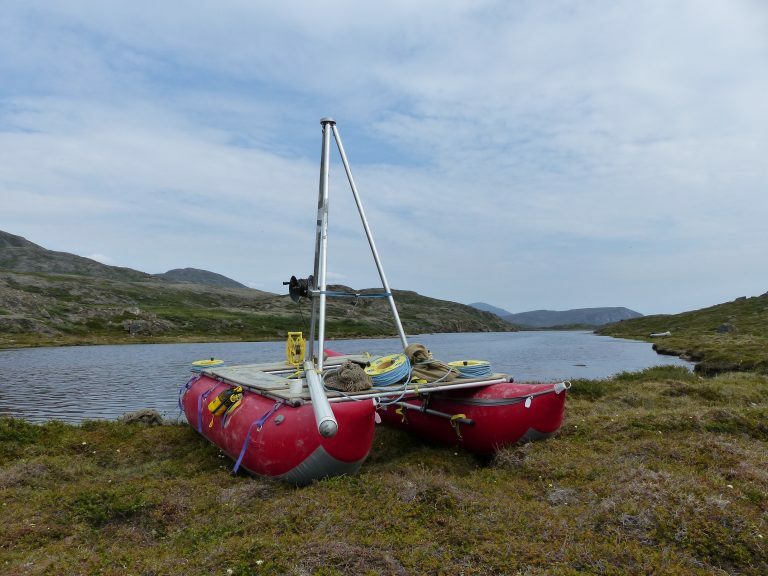 Although we were anxious to get right to work on the lake we were pushed back by challenges with logistics, so boats were inflated and the coring platform built in anticipation of tackling it first thing the following day. Over dinner we pulled up the 2016 bathymetry map of the lake and located out where the long piston core would be collected. For more on the Snow On Ice project please check the website. To read about Anna McKee’s work check out her portfolio art. Snow on Ice is an NSF-funded project that is multi-institutional and multi-disciplinary. 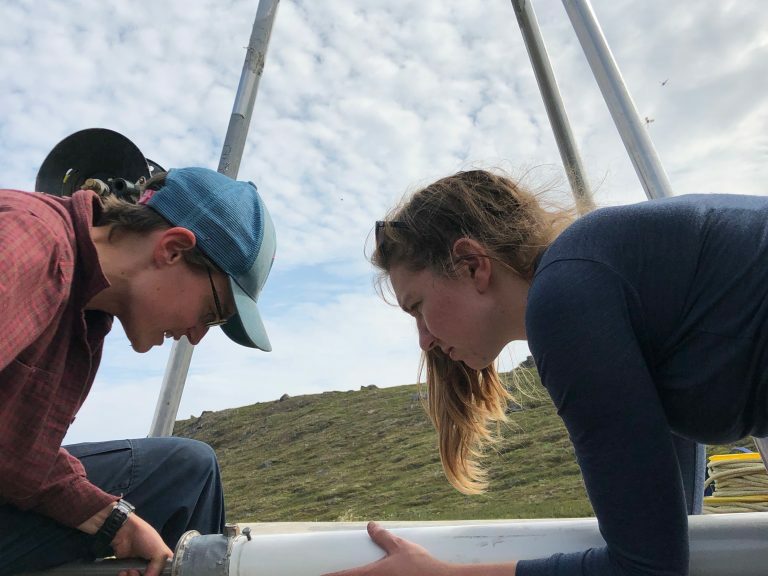 It brings together work on lake sediment cores, exposure dating of the rock, ice core data, leaf wax and water samples and sea ice history to feed new data into both regional and wider Arctic models of ice sheet history.